Finally a thick-client email program that seems to have stuck. 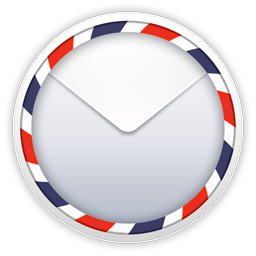 So far I am really liking Airmail. But the killer is the reliance on a rock-solid Internet connection, and GMail's own slowdowns. Even though there is an offline mode, it is such a downgrade it's not worth using. So if you need to use offline you're in bad shape; same if you're on a slow or lossy connection, or if GMail is having a bad day. Sadly, that's pretty often these days. Airmail is cheap ($1.99 in the App Store) and super featureful. It coexists well with GMail's paradigm (archive vs. delete, threading includes sent items, drafts). Great configuration options. Visually pleasing. Robust. I miss GMail's tabs. Those are still the best way to filter mail, and I was impressed with how well that feature worked and quickly became natural. Search. Airmail's isn't bad, but nothing is as good at this as Google's own. Gmail (with Chrome) has a great feature where you can drop in a picture and it is resized to look good. Lacking that I now have to manually resize my giant retina-display screenshots. So-long to Sparrow and Mail.app and Mailplane. Or until someone does really nails self-hosting.